We LOVE horses. All horses. So, we try to offer a wide variety of horses for sale, from Top International Quality Dressage Horses, to the All-Around, Safe, Sane, Amateur Superstars, so be sure you scroll down to the bottom of the horses who we are currently representing. We believe in matching the correct horse with the correct rider (and we know that the perfect rider exists for every horse), so our goal is to introduce you to your perfect horse. We pride ourselves on representing our horses honestly. Please remember that prices are subject to change. To be fair to us the prices of the horses have to reflect the investment of our time, training and care. This handsome boy is talented, sweet, brave and honest, the total package! Sergio is suitable for a Pro, a Young Rider or an Amateur Rider. He is balanced, has three expressive gaits and lots of flash! Sergio is a gentleman in the barn and is great for the vet and farrier. This is a top quality horse who is very smart and a blast to ride. He is doing clean changes and schooling 2nd/3rd level. Sound, healthy fit and talented for the FEI work! 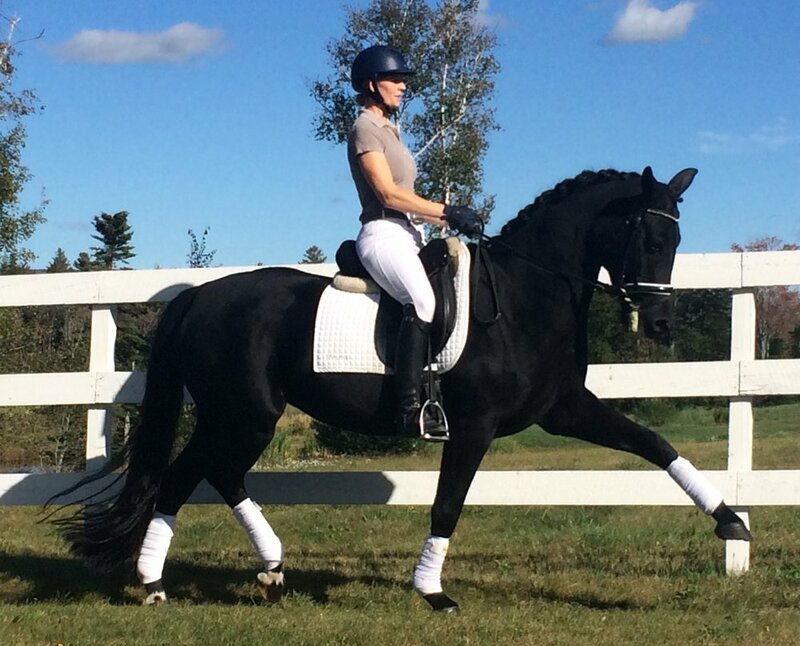 "Fina" is an FEI schoolmaster who has competed PSG and knows most of the Grand Prix. I have owned and trained this lovely girl since birth and it breaks my heart to sell her, but my personal circumstances are forcing me to find her the perfect partner. Fina is ready and willing to teach someone all of her fun tricks. She is an international quality horse, truly the horse of a lifetime. Fina has never had any injuries or lamenesses and she is even barefoot! If you are an AA rider looking to have a blast and to get an education from a correctly trained, top horse then you should come to meet this incredible girl! Due to my life circumstances she has basically only worked on and off for the past couple of years. She is currently unfit from sitting around and this video was taken of her second ride in 3 months, but you can get the idea ;-)! I will only sell Fina to a forever home with an AA rider who wants to have the horse of a lifetime. She is sired by the Famous Fuerst Heinrich! This is very rare breeding because he did not have many foals before he passed away. Fina travels well and is brave at shows. She was the champion foal at her inspection and is Premium. I am only very sadly selling her due to personal circumstances. Quinn is just plain incredible. She is a snuggle bug in addition to being gorgeous, talented and smart! This doll of a horse is a sports car, comfy to ride, nice in the contact and as fancy as fancy can be! Quinn has three stunning gaits with a canter that is a dream to ride. Quinn has already proven herself in the competition arena with scores of over 74%! Quinn is a willing partner and loves her job and is very well behaved in the show arena. She is very brave and laid back, she is not hot or lazy, just perfectly in the middle. Quinn is 2nd/3rd level with a well started, relaxed flying change and is already showing talent for piaffe and passage. She is currently on the path to be ready to compete in the FEI 6 year-old class this year (2019). If you want a fun, uncomplicated, standout horse to love and enjoy you will adore this girl :-)! Quinn has always been sound and healthy. She was imported from Germany and is sired by the incredible stallion Quaterback! She looks and moves just like her Daddy (WOW!!). Quinn is suitable for an AA or a Pro. I am 5 feet 9 inches and due to her round body and cresty neck I fit her well, so she is the perfect size for most women. Quinn’s price was just significantly reduced due to owner’s personal circumstances. Congratulation to Betsy Moeller-Sally on her purchase of this dear boy. We are thrilled that Emo will be with Betsy and her trainer Colleen O’Connor-Dzik in nearby Massachusetts. This wonderful creature will be so missed by all at Northshire. Betsy is going to have a blast learning from this superstar! We wish this new partnership all of the best! Congratulations to Staysea Colteax on her purchase of our homebred baby boy! It was love at first sight with these two and knowing that Ragazzo is with the perfect person is amazing! This was meant to be. Our warmest congratulations to Rosemary of CO on her purchase of this wonderful boy! They are going to have many great adventures together!! They are definitely two peas in a pod! Congratulations to Lyndsey Bailey on her purchase of this Rockstar!!! These two are a match made in heaven and it was love at first ride. We are so thrilled to have played matchmaker with these two and we expect great things from them! Yay!!! Congratulations to Hidde's very lucky new Mom Debbie McGoldrick and her trainer Tracey Olson on the purchase of this fabulous boy! They are going to have a blast with this talented and sweet boy. Hidde is also lucky to be heading to a beautiful farm on Martha's Vineyard where he will be loved and spoiled and have a chance to shine! Congratulations to Sarah on her purchase of this fabulous horse! Henley and Sarah had an instant click and we are so happy that her long search ended with finding this darling boy. We know that they are going to have a blast together and that he will be her dream horse. They are both lucky to have found the other. Now we just need some good riding weather so they can begin getting to know each other :-)! We are SO excited to announce that Antigua has been sold to the up and coming talented young rider Tess Holloran! This pair has such a bright future ahead of them and we could not be happier. They are off to Wellington in a few weeks for the winter season and we look forward to the updates and details as they begin their incredible journey together :-)! Congratulations to Pam Lewis on her purchase of Emmett! He is a wonderful young horse with a bright future ahead of him! We will them the best of luck on their fun journey together! We offer our warmest congratulations to Heather Mangione on her purchase of this incredible boy! With expert help from Alison Johnson we know that Heather and Fonzie are going to accomplish incredible things together. We could not be happier with this match and both Heather and Fonzie are incredible and totally deserve each other! We wish them all of the success in the world! The horse/rider teams that we have created this summer make us love what we do even more :-)! Congratulations to Carmen on her purchase of this big Teddy Bear! Donovan is getting the wonderful, loving forever home that he deserves and Carmen is getting one SPECIAL boy! Everyone at Northshire will be sad to see Donovan go, but we know he will be in great hands :-)! Congratulations to Cathy Nimick on her purchase of this lovely, talented and sweet mare! Athena will be staying in VT, so we hope to run into this them and have a chance to see their progress! This pair had an instant click and we know that they will have a great future together :-)! Daegan is headed to Maine to join the Bishop Family! Congratulations to them on their purchase of this fun horse! We look forward to the updates :-)! Congratulations to Mary Melloni on her purchase of this fancy boy! These two are a match made in heaven and are going to have a blast together. We are so excited that they found each other :-)! Congratulations to Jami Scheer on her purchase of the lovely mare! This is an exciting partnership and we look forward to updates on their journey together! Congratulations to Emma Whitman of Virginia on her purchase of Neve. We are expecting great things from this pair and wish them luck on their journey together! Congratulations to Karen Latter on fulfilling her lifelong dream by purchasing this dear boy! We know that they will have a wonderful partnership and friendship and we couldn't be happier for either of them! Congratulations to Eileen Sherman on her purchase of this exquisite mare! We are already receiving rave reviews about this partnership and we are sure that they will love and cherish this sweet girl as much as we did! Congratulations to Catherine Treanor on her purchase of this teddy bear! We are so thrilled that Reuben has found the loving home that he deserves and we look forward to hearing how much FUN Catherine has with this dear boy!!! Congratulations to Karma Kitaj on her purchase of this wonderful horse! With the help of Jess Systo Karma and Andy will have great success together! CONGRATULATIONS to Eleanor Harrison of Colorado on her purchase of this incredible horse! With the help of Sandy Hotz (FEI 4* Dressage Judge) we know that a bright future lies ahead for this exciting combo! CONGRATULATIONS to Jane Plant of California! Lucky will continue his carer with an ambitious Amateur rider in Southern California. Lucky is Lucky :-)! Congratulations to Tova Arnold of Utah on her purchase of Leo!!!! We could not be happier with this match, what a perfect duo! We look forward to hearing all about the successes that this pair will have together :-) ! Congratulations to Carol Meise on her purchase of Emperador! We are so excited to keep this wonderful horse in the "family" and we look forward to assisting them in fostering a successful partnership! We LOVE Lusitanos! Congratulations to Mary Johnson, a long time member of the Northshire Farm Family!! We are excited that Fiona will continue her career with Emily and Mary at our farm :-)! Our sincerest Congratulations to Wendy Arbuszewski of South Carolina on her purchase of Cabot! This lucky boy will be in Sunny South Carolina this winter instead of in snowy VT! Congratulations to Mary Albert of New Jersey on her purchase of Wren! It was love at first sight and Mary will have a wonderful partner and friend! 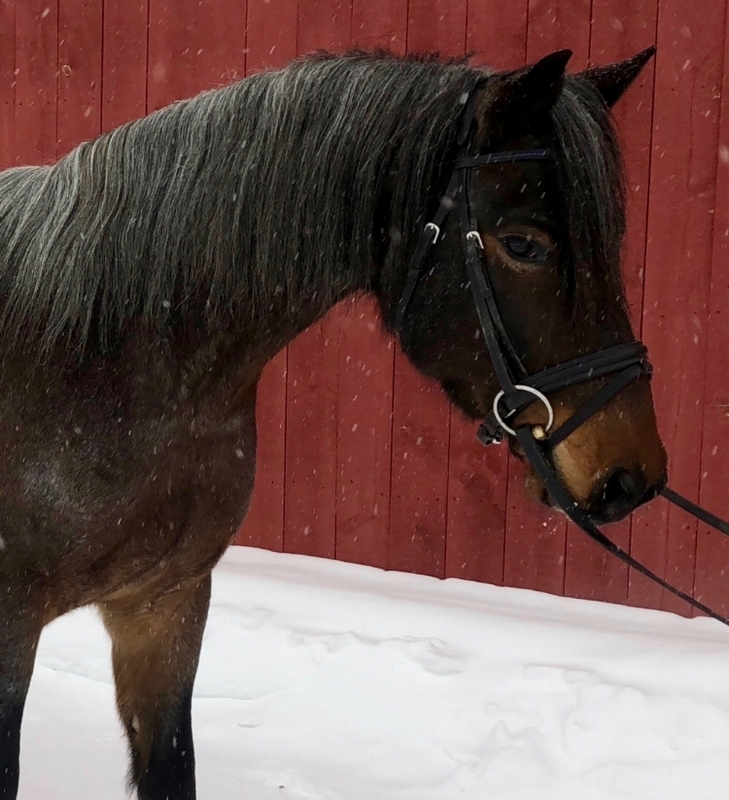 Wren will be at Cornerstone Andalusians. Congratulations to Nancy Frank of California! What a wonderful home for a special pony! Best of luck! Congratulations to Leigh Dunworth of Massachusetts on her purchase of Wittelsbach D! We will miss our boy, but we know that he is in great hands with Leigh and her trainer Kim Litwinczak! We wish them much success!